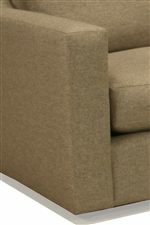 This convenient rectangular ottoman has casters at the base, for ease of mobility. Pairing perfectly with a swivel chair, reclining furniture, or your busy home theater and entertainment room, this ottoman will add comfort and style. The 1191 Contemporary Rectangular Ottoman with Casters by McCreary Modern at AHFA in the area. Product availability may vary. Contact us for the most current availability on this product. The 1191 collection is a great option if you are looking for furniture in the area.